H-BLOCK Hunger Striker and Sinn Féin Assembly member Raymond McCartney has hit back at knee-jerk unionist criticism of a new film on the 1981 Hunger Strike being showcased at the Cannes Film Festival. Hunger is the debut feature film by the Turner prize-winning artist, Steve McQueen. It details the last six weeks in the life of Hunger Strike leader Bobby Sands. The 1981 Hunger Strike, in which Irish republican prisoners fought to regain their status as political prisoners, saw ten prisoners die as the British Government closed its eyes and ears to international appeals to resolve the dispute without loss of life. In the course of the Hunger Strike, Bobby Sands was elected as MP for Fermanagh/South Tyrone as an Anti-H-Block/Armagh Political Prisoner candidate. The sacrifice of Hunger Strikers Bobby Sands, Francis Hughes, Raymond McCreesh, Patsy O’Hara, Joe McDonnell, Martin Hurson, Kevin Lynch, Kieran Doherty, Thomas McElwee and Mickey Devine effectively defeated attempts by the British Government to criminalise republican prisoners and by extension the entire republican struggle. 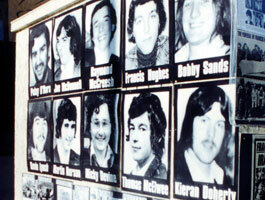 It resulted in a huge upsurge of support for the IRA throughout Ireland and across the world. In Hunger, Bobby Sands is played by actor Michael Fassbender (31), who was born in Germany and moved to County Kerry as a child. Fassbender reportedly starved himself for two months in preparation for the role. Now DUP MP Gregory Campbell has tabled a motion at Westminster criticising the film’s content. Commenting, Raymond McCartney dismissed the stunt as “typical Gregory Campbellism”. “Has he actually seen the film? This is another typical Gregory Campbellism. “As republicans remember the 27th anniversary of Raymond McCreesh and Patsy O’Hara’s deaths tomorrow, the legacy of the Hunger Strikers remains a symbol of resistance around the world. “The legend of Bobby Sands has lasted the test of time, far greater than Margaret Thatcher or her counterpart, General Pinochet of Chile.